Yesterday’s Beer in Ads post featured an ad for Budweiser from the 1970s. The ad, Pick-A-Pair Twice!, was trying to get people to buy not one, but two six-packs. I wondered in the post when the 12-pack debuted. My ignorance about this stems largely from having grown up in Pennsylvania, which is a case state, one of the weirder examples of what happened when alcohol laws were left to the states following the repeal of prohibition. I’d never really thought about the 12-pack package until I was posting that ad last night. I remember reading about breweries experimenting with different size packages in groceries way back when until they decided six was the right weight for women shopping to pick up and bring home (assuming that’s even true). After high school I went into the military, stationed in Virginia and then New York City, but generally went to bars and rarely bought beer for at home since I lived in a barracks. After my stint in the army, I moved back to PA. When I moved to California in 1985, there were 12-packs everywhere, though in retrospect I don’t remember even paying any special notice of them. By that time, most of the beers I was interested in came in 22 oz. bottles, or maybe six-packs. Who was the first early small brewer to have 12-packs? My guess is probably Samuel Adams. Sierra Nevada wasn’t until the latter 1990s, I believe. I was still the chain buyer at BevMo when they debuted. RedHook might have been early on, too. Anyway, I wasn’t expecting an answer, but happily Dave “Beer Dave” Gausepohl sent me an excellent response. Beer Dave is breweriana collector of epic proportions, and has over 400,000 items in his collection, He’s also a board member of the BCCA — the Brewery Collectibles Club of America and a frequent contributor to All About Beer magazine. Here’s his short history of the 12-pack, written extemporaneously, from his own studying of beer history, reprinted with his kind permission. Six-packs appeared first by Pabst just following World War II. They tested numerous package sizes and determined in a sexist fashion that the average housewife could comfortably carry six beers home with the shopping. The 12-pack came a few years later, and it resembled the dimensions of the Full Sail Session 12-packs. This was due to the fact that the first cans in 12-pack packages were cone top and crowntainer cans. This was also a corrugated carton. These cans were able to be filled on most breweries bottling lines with little retooling and they did not have purchase separate packaging equipment. The one way bottle was much more desired than cans when the flat top can debuted in 1935. World War II also limited the steel for cans and returnable bottles were a friendlier package towards the war effort. In the 1960s when the convenience store took off, six-packs were the package of choice. They worked with the shelf space mostly laid out for milk and dairy items. The moisture of the retailers’ refrigeration equipment also was not kind to packaging larger than six packs. Also glass was still the package of choice for beer. Glass was a cheaper package than steel or aluminum. Many breweries had 8-pack glass as their package. It was not until after the oil crisis of the 1970s that the weight of packaging became a major cost factor. This movement pushed breweries to pursue cans over glass. 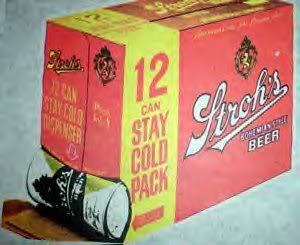 A Stay Cold Pack, this one by Stroh’s. Rainier debuted the Cold Pack in the early 1960s. 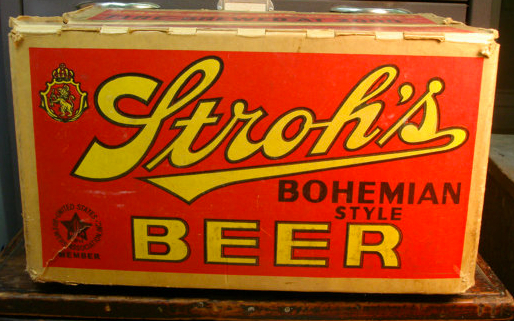 In the Midwest it was not until the late 1960s when Stroh’s pioneered a similar 12-pack with a foilized paper that could with withstand the moisture of the refrigeration systems used at retail. A number of carton manufacturers like Mead developed waxed versions of cardboard to withstand the moisture levels. Corrugated rather than cardboard was the leader prior to the advent of the moisture resistant 12-pack. Back then just like today wet corrugated boxes have NO strength or purpose. 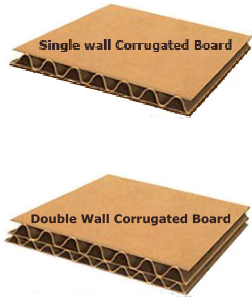 The difference in corrugated boards. The Pick-A-Pair campaign was a huge success for Budweiser. Ironically a number of states did not allow for 12-packs to be sold. The eight-pack was the largest package allowed to be purchased at retail in numerous states. The enormous growth to the suburbs also increased the demand for a larger retail pack. Since the country was driving to the store rather than walking or taking the bus or street car, more items could be carted home on the average shopping trip. The development of the supermarket drove this demand for package innovation. Also, the advancement of the size of the household refrigerator made this a more inviting package. 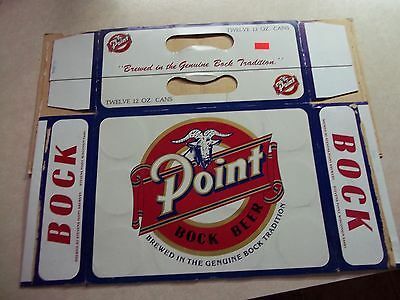 An example of a cardboard 12-pack. Prior to the 1970’s Returnable bottles in the 12, 16 and even quart bottle were very much a part of how beer was retailed. These fiberboard cases were very durable and withstood many trips back to the breweries to be refilled. These were a desired package with the on-premise trade. I imagine you remember the heavy wooden crates and glass bottles that soft drinks were packaged in until the 1980s. Thanks Beer Dave. Now you know. 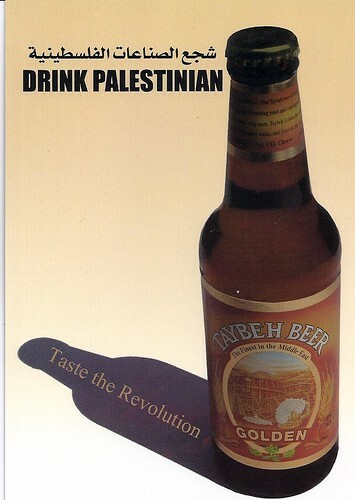 A couple of days ago, I posted a video from Palestine’s only brewery, Taybeh Beer, founded in 1993 by Nadim Khoury, who learned to homebrew while living in Boston. I admit that I wondered how the beer tastes, so I was delighted to hear from fellow beer blogger David Turley, who writes Musings Over A Pint. Turley had an opportunity to try the beer during a trip with his family to Jerusalem last August. He recently posted his impressions of the beer and stories from his pilgrimage in Taybeh, A Beer Without A Country. Give it a read, it definitely helps round out the story. Thanks for your insights David. A postcard from Taybeh (courtesy of David Turley). Sadly, the date chosen for Don Younger’s memorial last Sunday meant I could not attend. There were too many long-standing obligations with SF Beer Week. 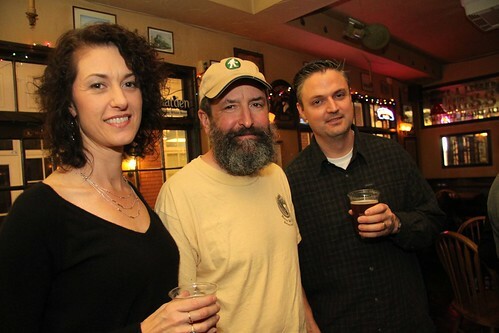 Happily the Bay Area was well-represented, with several friends in attendance, including Dave Keene and Jennifer Smith from the Toronado, Vinnie and Natalie Cilurzo from Russian River Brewing, and Tom Dalldorf, publisher of the Celebrator Beer News. Tom took a lot of photos and was kind enough to write a guest post for me, giving his account of the day. He also has a great piece up on the Celebrator website entitled Don Remembered. Thanks Tom. 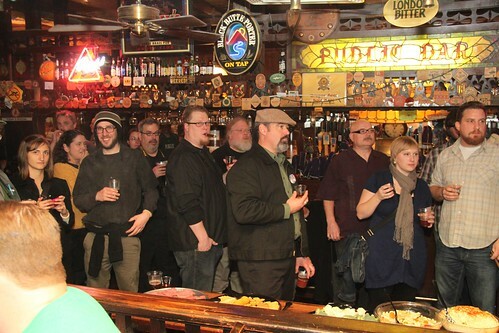 A memorial for the late Don Younger, renowned publican and ultimate beer industry character, HAD to be held at his world famous Horse Brass Pub in Portland. The only question was how. Everyone even remotely connected to the beer industry knew him and respected his many contributions to brewing and beer culture and would want to be there. 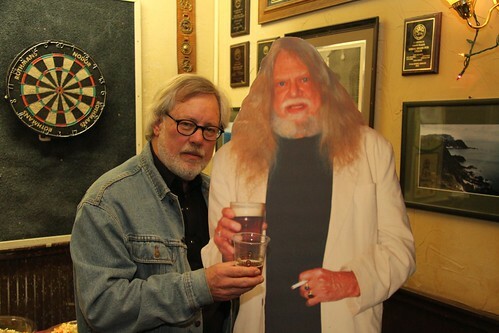 Tom Dalldorf posing with one of many Don Younger life-size stand-ups at the memorial. Close family and HB staff decided to hold two gatherings on Sunday, February 13, to celebrate his life and times. One would be by invitation only and held inside the pub starting at 11 am and the other would be open to the public and start at 2 pm under tents erected in the parking lot behind the pub. 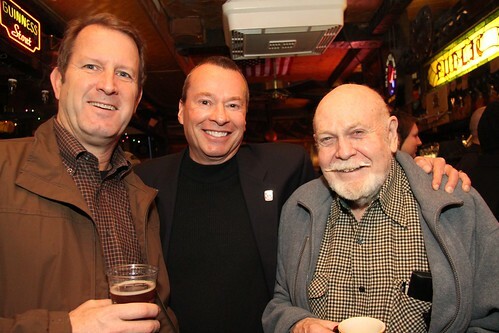 Gary Fish (from Deschutes), Kurt Widmer (from Widmer Brothers) and beer writer Fred Eckhardt. The usual Portland rain seemed to mercifully hold up while the set up and arrivals took place. Beer industry veterans and personal friends from as far away as England arrived to celebrate Don’s many accomplishments and tell outrageous Don stories late into the afternoon. The small but tightly knit PNC (Publican National Committee), of which Don was a founding member, gathered with Tom Peters, Monk’s Café in Philadelphia, having traveled furthest to be there. Others included Matt Bonny, Brouwer’s Café in Seattle; Chris Black, Falling Rock in Denver and David Keene, Toronado in San Francisco. Lisa Morrison, Chris and Cheryl Black (from the Falling Rock) and Tom Peters (from Monk’s Café). Around 1 pm a toast to his memory was offered in the pub with an amazing number of shots of his favorite Macallum 12 year old Scotch distributed to the guests. Yet another toast took place inside and in the tent set up in the parking lot packed with Younger fans. This toast was picked up at pubs and beer joints all across the Pacific Coast time zone promptly at 3 pm. Jay Brooks led the toast at the Sour Beer Fest at Triple Rock in Berkeley. Others toasted at 3 pm in their own time zones. 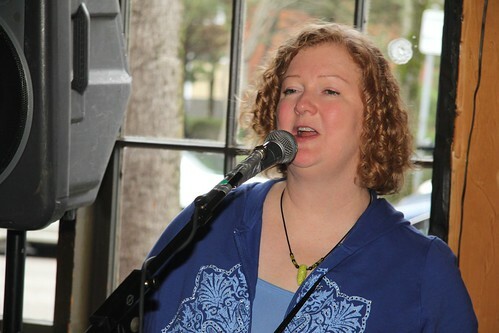 Lisa Morrison — a.k.a. The Beer Goddess — leading one of the many heartfelt toasts to Don. 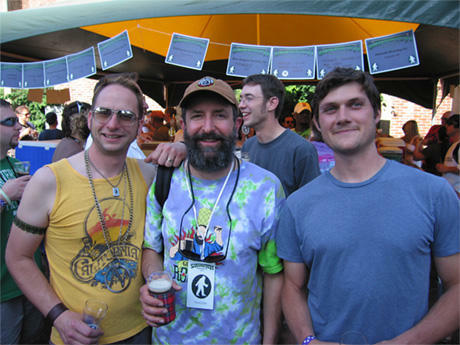 Brookston Beer Bulletin is offering up some space for selected photos from the gathering in Portland. 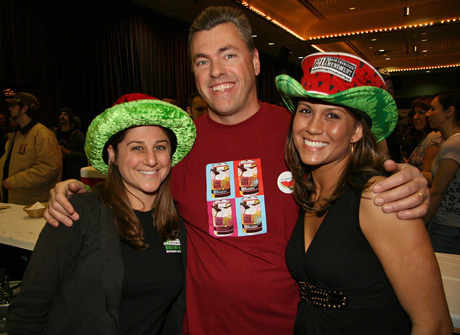 The beer world has lost a champion but his inspiration and dedication to the beer culture we all love will live on. Below are a few more of Tom’s photos from the memorial. Thanks again, Tom. Natalie Ciurzo, John Maier (from Rogue) and Vinnie Cilurzo. 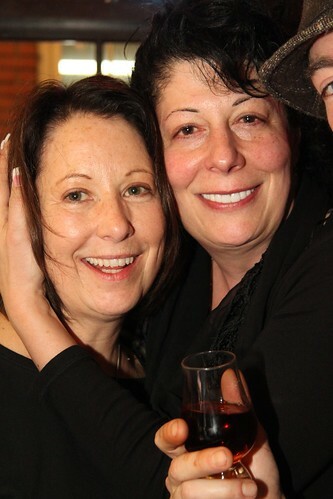 Longtime friend Joy Campbell with Dave Keene’s wife Jennifer Smith. The crowd inside the Horse Brass pub. 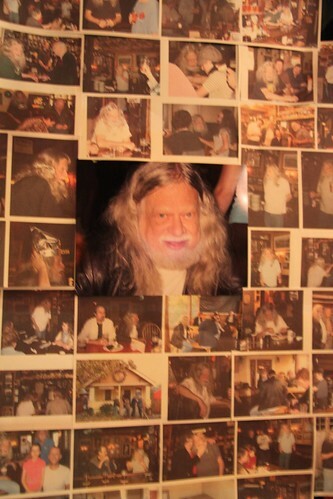 A collage of memories for the man of the hour: Don Younger 1941-2011 R.I.P. Now, you’d think this maybe isn’t a big deal. Well, you’d be wrong on that. It is. This further puts the Feds on record as saying, basically, a drink is a drink is a drink, even though we all know in reality that’s not the case. You can be sure that Diageo and DISCUS — the spirits lobby — worked with a laser focus to get this sentence added. It’s the next step toward alcohol equivalency (for excise tax, labeling, and consumer access issues), even though Diageo and DISCUS have previously said this is not what they’re after. LABELING: First let’s consider labeling. As we know, the federal TTB is considering (since 2003) allowing alcohol producers to include voluntarily display serving facts (which includes standard alcohol content for servings) on labels. This is an issue that large distillers support, but brewers and wineries typically oppose because some believe the push for serving facts is a stalking horse for equivalency. INDUSTRY SPLIT ON STANDARD DRINK: The Wine Institute and DISCUS are on the same side of most issues, such as opposing the CARE Act, but standard drink isn’t one of them. Monica told our sister publication, WSD, that the updated definition is “very clear” and shows that “each standard drink contains the same amount of alcohol.” When looking at the science involved, each serving has the “same effect on the body — potential benefits and potential risks.” She also noted that the National Institute on Alcohol Abuse and Alcoholism (NIAAA) already defines a standard alcoholic drink as anything containing 0.6 fluid ounces. Wait ….. 0.6 fluid ounces of alcohol? Not 0.5 fluid ounces? There are plenty of public health folks who defined drinks as having 0.5 fluid ounces of alcohol as a standard drink. Who, I wonder, lobbied the USDA to add that extra 0.1 fluid ounce to the definition? The Wine Institute, for one, is livid. For once they are on the other side of DISCUS on an issue. The WI issued a statement on Tuesday, saying there is no such thing as a standard drink: “We agree with the time-tested definition of a serving as being 12 fl. oz. of regular beer, 5 fl. oz. of wine, or 1.5 fl. oz. of 80-proof distilled spirits but are concerned about the additional statement that each of the drinks contains the same amount of alcohol. 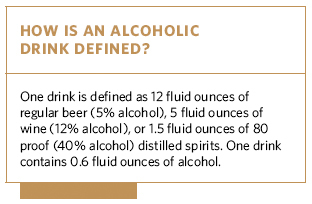 A precise fluid-ounces-of-alcohol statement implies that the alcohol content is the same for every drink of wine, beer or distilled spirits when, in reality, alcohol content varies widely from drink to drink. Consumers should not be misled into believing there is such a thing as a ‘standard drink.’ In fact, the term ‘standard drink’ does not appear in the Dietary Guidelines.” This is true. But it doesn’t dull the fact that a federal agency has swallowed the equivalency argument hook, line and sinker while the rest of the industry sleeps. The Beer Institute and the NBWA have remained mute on this issue, so far. But clearly it is important: As one alcohol politico told me: “Once the language is in a federal government guideline, it’s in the bloodstream.” What he meant by that is that, since the USDA has defined a drink as 0.6 ounces of alcohol, it gives the TTB cover to move forward with their “serving facts” labeling, and maybe it gives the states the argument to increase taxes on beer and wine and offer it at more times and in more channels, and maybe it gives the feds something to point to when considering an excise tax increase. It’s a slippery slope, my friends, toward equalization of taxes and access among the beverages, which works against beer and wine and is probably just bad public policy. In fact, if alcohol excise taxes were suddenly equivalent, it would virtually kill the wine and beer industries, and we’d be a nation of vodka swillers like Russia, wiping away 200+ years of cultural and policy differences between the beverages. It was Thomas Jefferson who logically first put forward the notion that moderation should be nurtured by the government by encouraging the consumption of beer and wine over spirits. It brings to mind the old story where August Busch III went to Capitol Hill and demonstrated to a Congressman considering equivalency that a drink is not a drink. He reportedly said, “I’ll drink these three Budweisers, and you drink these three dry martinis, and at the end we’ll see who is more intoxicated.” It’s a shame our beer industry leaders don’t pull more stunts like that. Ethanol is ethanol, to be sure. 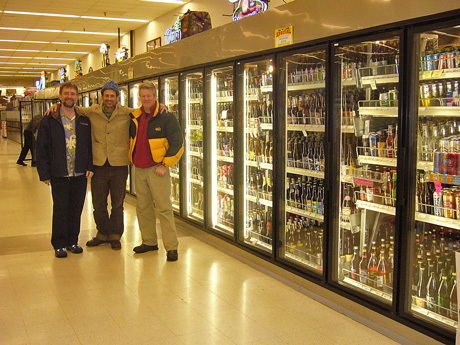 But different types of bev-alc are consumed by the majority of Americans in different ways. Ethanol is ethanol, but a drink is not a drink. Thanks Harry. If you don’t know about his Beer Business Daily, especially if you’re in the beer business, I highly recommend it. You really should subscribe to Harry’s newsletter. James Spencer at Public CEO, a California government-focused blog, has an interesting read today about an e-mail he received from the Marin Institute and what he found when he looked closer at it. It’s entitled Who’s Really Behind the Booze Tax and Why? and it’s certainly great to see more people taking a critical look at San Francisco’s proposed new tax on alcohol and exposing it for what it really is. They hate alcohol and don’t want it around. Fair enough, but why weren’t they open from the start? The email should have read: “We are against alcohol and we don’t want you to drink it.” The Marin Institute isn’t looking out for the best interest of the city of San Francisco or its economy. It has its own interests. And if their true goal is to stop us from drinking alcohol, then they must understand that this tax is going to have a dramatic effect on reducing sales, right? Sounds like they are making the argument for why this additional alcohol fee would be a terrible idea. Last month, Monk’s Cafe and Beer Emporium in Philadelphia, Pennsylvania hosted a unique beer dinner with beer cook Lucy Saunders at the helm to support her new book, Grilling with Beer. All of the beers paired with each course was a craft beer in a can. 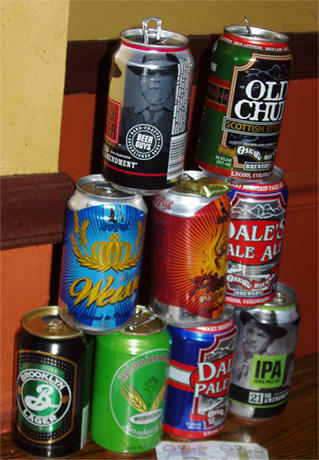 A growing trend among small brewers, there are better than two dozen now putting their beer in a can. The Philadelphia Inquirer attended and reviewed the dinner, titling their article “Can do — craft-beer makers kicking glass, going metal.” Lucy sent me some of her photos from the dinner. Craft brewers certainly can be proud of canned beer – at least, that’s the take-home message from a celebration of all-American grilled food and canned brews at Monk’s Café, Philadelphia, PA, in May. To help Lucy Saunders launch her newest book, Grilling with Beer, Chef Adam Glickman and his culinary team prepared a banquet of BBQ ribs and fixings. Hosts Fergus Carey and Tom Peters called on top craft brewers offering their wares in cans to share the bounty. Stacks of cans grew like Great Pyramids of Giza on tabletops, as we sampled skewers of apricot-wheat ale chicken, Malt Monster Shrimp with 21st Amendment’s Watermelon Wheat and the Butternuts Heinnieweisse. Brooklyn Lager paired with Chef Glickman’s grilled asparagus salad, and Dale’s Pale Ale partnered with the Porter Ginger Salmon Skewers. Sly Fox’s tasty canned offerings accompanied the beerbistro’s tender Apple Ale Ribs (braised in Éphémère Pomme before finishing on the new grill in Monk’s kitchen). And at the end, we pulled the pop-tops off of cans of Old Chub Scottish ale, malty and rich enough to handle the Adult S’mores, stuffed with melted bittersweet Belgian chocolate and marshmallows made with St. Bernardus. It was a cook-out to celebrate craft beer tasting just as the brewers intended, served from cool and classic aluminum cans, so convenient for any BBQ with beer. That’s why I think of cans as mini-kegs, perfect for keeping flavors fresh. 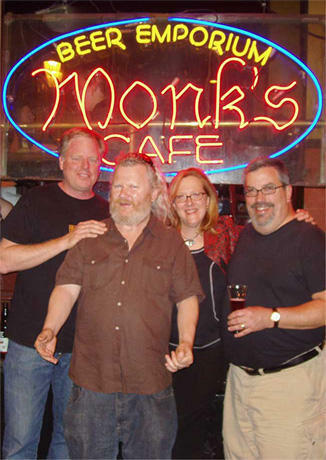 Shaun O’Sullivan from 21st Amendment, Fergie Carey, co-owner of Monk’s, Lucy Saunders, the beer cook, and Tom Peters, also co-owner of Monk’s. 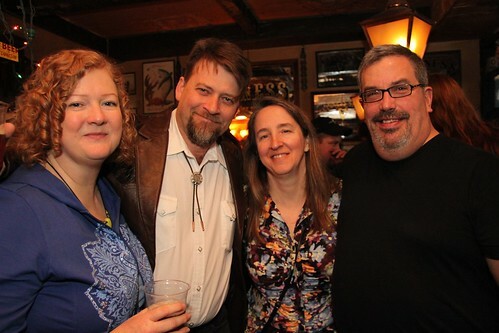 For more photos by Lucy Saunders from the beer dinner, visit the photo gallery. Last Saturday, while I was attending the Santa Rosa Beerfest, 550 miles to the north in Eugene, Oregon, another beer festival was taking place. The fifth annual Sasquatch Brew Fest is a benefit for the Glen Hay Falconer Foundation, a charity set up after the untimely death of the well-known Eugene brewer in 2002. The Foundation provides scholarships for brewers to attend the Siebel Institute in Chicago. Shaun O’Sullivan, co-founder and brewmaster of 21st Amendment Brewery in San Francisco, attended the festival and was kind enough to share some of his photos. Thanks Shaun. Jamie Floyd, from Ninkasi Brewing, John Maier, from Rogue Brewing, and Nikos Ridge, also from Ninkasi. Shaun O’Sullivan, co-founder and brewmaster of 21st Amendment Brewery in San Francisco, and his girlfriend Adrienne McMullen. 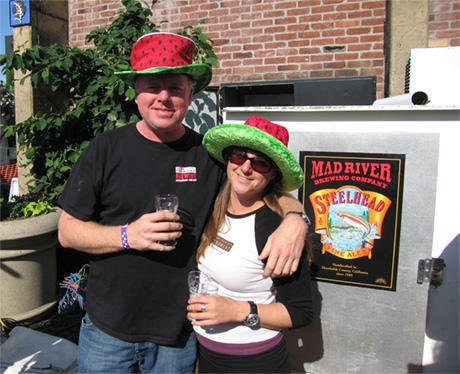 For more photos from this year’s Sasquatch Brew Fest, visit the photo gallery.